IUM alumna in the Forbes Under 30 list Europe! Arijana Koskarova, MBA 2017, opened her training hub in North Macedonia and made it to this year Forbes Under 30 list Europe. Every year, the Forbes “30 Under 30 Europe” LIST features 300 young disruptors, visionaries and rising stars from across Europe, who are transforming industries and setting a new agenda. The list includes 30 honorees in each of the 10 categories, all aged under 30 years old. Arijana is featured in the SOCIAL ENTREPRENEURS category. What have you done since you graduated from IUM? Since graduating the Monaco MBA, I went to Hong Kong where we pitched a KPI app on the RISE Summit as Alpha exhibitors. After the summit I came back to North Macedonia where I decided to challenge myself as entrepreneur and opened Creative Hub. Creative Hub is a training hub where professionals come to skill up through courses or short Academies in the area of digital marketing, human resources, web design, graphic design and advertising etc. We also have a co-work center as part of the hub and we organize a networking events for the users of the hub. How did your MBA at IUM help you in your current position? My previous experience was in the corporate world but in the area of cruise lines. I decided to sign up for the Monaco MBA because I wanted to get a solid business school education. I always thought that I am good in what I am doing (marketing & sales) because I had corporate experience in working in marketing, however I lacked knowledge in Financial Accounting, Corporate Finance, Microeconomics, Statistics etc. What IUM really gave me is motivation to become an entrepreneur and also a jump start to open a business. I really liked that all the lecturers had previous business experience and taught us skills which are based on real-world experience. Do it and fail rather than wait for the right time or circumstances. Action, action, action. Where does your entrepreneurial spirit derive from? My entrepreneurial spirit derives from the eagerness of success. It is not that I am scared to fail but rather I am eager to see what more we can reach. What is your favorite memory about IUM? I liked that we were small group and we are still keeping in touch after graduation. Congrats Arijana, what a fantastic achievement! 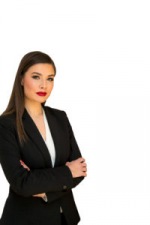 Arijana Koskarova, MBA 2017, opened her training hub in North Macedonia and made it to this year Forbes Under 30 list Europe.Every year, the Forbes “30 Under 30 Europe” LIST features 300 young disruptors, visionaries and rising stars from across Europe, who are transforming industries and setting a new agenda. The list includes 30 honorees in each of the 10 categories, all aged under 30 years old.Arijana is featured in the SOCIAL ENTREPRENEURS category.What have you done since you graduated from IUM?Since graduating the Monaco MBA, I went to Hong Kong where we pitched a KPI app on the RISE Summit as Alpha exhibitors. After the summit I came back to North Macedonia where I decided to challenge myself as entrepreneur and opened Creative Hub.Creative Hub is a training hub where professionals come to skill up through courses or short Academies in the area of digital marketing, human resources, web design, graphic design and advertising etc. We also have a co-work center as part of the hub and we organize a networking events for the users of the hub.How did your MBA at IUM help you in your current position?My previous experience was in the corporate world but in the area of cruise lines. I decided to sign up for the Monaco MBA because I wanted to get a solid business school education. I always thought that I am good in what I am doing (marketing & sales) because I had corporate experience in working in marketing, however I lacked knowledge in Financial Accounting, Corporate Finance, Microeconomics, Statistics etc.What IUM really gave me is motivation to become an entrepreneur and also a jump start to open a business. I really liked that all the lecturers had previous business experience and taught us skills which are based on real-world experience.What is the best business advice you’ve received?Do it and fail rather than wait for the right time or circumstances. Action, action, action.Where does your entrepreneurial spirit derive from?My entrepreneurial spirit derives from the eagerness of success. It is not that I am scared to fail but rather I am eager to see what more we can reach.What is your favorite memory about IUM?I liked that we were small group and we are still keeping in touch after graduation.Congrats Arijana, what a fantastic achievement! You don't have the right to access or add a comment. Please log in first. The Mark Challenge 6th Edition - Save The Date!